The golf cart’s been stolen. The suspect is about 5’8″, blonde hair. 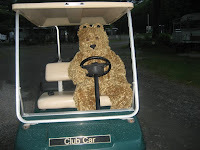 Last seen driving a green golf cart, and driving around Lahave River Campground. If you see the suspect make sure to approach him. REWARD: A good time to be had by all. This entry was posted in Uncategorized on June 26, 2009 by admin. I think I saw this guy around Cole Harbour the last time I was there!